Our customer base knows from experience that our customer support is and has been consistently dependable. We have always gone by the principal that our customers don’t lose. People say that our quality is especially high and hunters note we have one problem, our gear lasts to long. We can maintain this level of confidence and service because DAY ONE CAMOUFLAGE is a smaller family owned size company capable of providing follow through attention to our customer’s needs. Plus our production takes place right at our own facility or one of our long time local vendors. Therefore, we can track and make adjustment details on the spot. We are not fixed to an SKU design from a foreign offshore supplier. 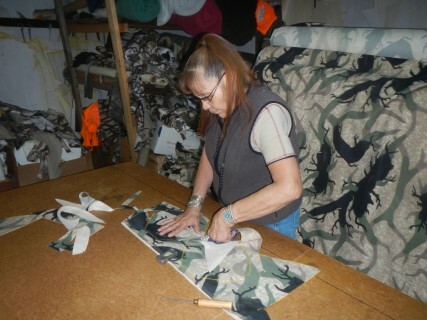 Our products are hand sewn by an individual from beginning to end and made here in the USA. Caption; Daisy, a full blooded Navajo supporting us for over a decade. Picture of Daisy at cutting table.